Just east (toward Shinjuku) of Omekaido & Yamate Dori intersection. Go the Koban, continue 10 meters after MacDonald’s, on your right. 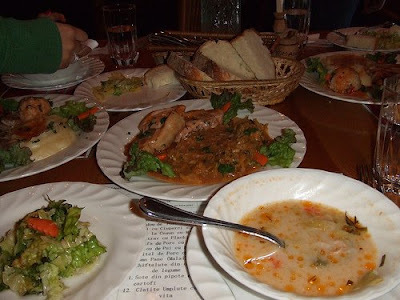 The cook is from Brasov. Food is great. Don’t forget to print the coupon if you want a nice discount on a “full menu”. I often ride my bicycle along Omekaido Dori to Shinjuku. 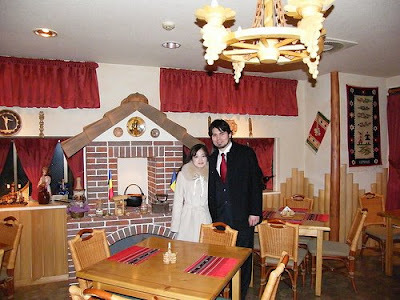 Along the way, near the Marunochi Sen’s Nakano Sakue Eki, I pass Restaurant Romania. Once, I was even invited in by a charming waitress, but had to decline. Today, there was time and I did stop and did have a very nice lunch. [..] The office crowd was having a set lunch for the whopping fee of Y1000. That is quite a deal considering there were three different choices of lunch sets available. Restaurant Romania offers about 20 different lunch choices the availability of which rotates to keep the clientele guessing what is available for their next lunch. Of the three, I zeroed in on a choice of chicken with a white cream sauce with mushrooms or the grilled, salted pork (salted with salt from Romania, supposedly). I chose the pork. First delivered was a German-style cole slaw and a bowl of chicken soup. The soup was a clear orange, in color with bits of very tender chicken in it. This was served with a basket-full of crispy baguette. The main course then came. The generous portion of boiled potatoes seemed somewhat bland, yet nutritious with its boiled beans and peas all liberally sprinkled with chopped parsley. The pork chop, though, caught my attention. It was attractively seared and I noticed the distinct aroma of charcoal wafting from it. Indeed, it had been barbecued. Quite a yummy dish. The Romanian waitress, after eating, tempted me with a choice of coffee or tea, which I declined. This was an inappropriate response, and she gave me a refreshing glass of apple, juice instead: all of this along with a small scoop of ice cream for dessert. and some pictures with a japanese review here. Ayako, my sweetheart, had some good things to say about the restaurant here. This entry was posted in Ego, Fotografii and tagged english, Japonia. Bookmark the permalink. the food looks as delicious as always. I've been to other romanian restaurants in Tokyo, but not this one. I won' t miss it next time. Ayako did not like the one in Ginza much. But she loved this one! Seen my posts from korea ? Here. wow I love the blend of food and cultures here. Ar trebui sa-i intrebam pe cei care mai sunt la Tokyo. Eu n-am mai fost de ani de zile. se pare ca ultimele postari sunt vechi. are cineva idee daca restaurantul mai functioneaza? am sunat dar fara success. Buna Ion. Anul trecut cand am trecut prin tokyo (aprilie 2016) functiona.